Dosbat: Arctic Methane: The paleo-perspective. There are other theories around the PETM and the details remain uncertain. However it can be said with some confidence that the PETM started with a warming due to CO2 emissions that was then amplified by a low carbon13 source, methane seeming the least problematic option. In most areas of science one can afford to remain agnostic about issues in doubt, however Anthropogenic Global Warming (AGW) and the risks it poses, methane hydrate being just one, do not allow for a 'wait and see' approach. So my working assumption is that the PETM was indeed a warming amplified by methane, with marine hydrates being a likely candidate for a major player in the amplification. Working on the assumption that methane emissions were the amplifying factor, the next issue is whether the geological record can tell us the speed of the emissions. McInerney & Wing's 2011 Review paper states that the onset of the negative excursion of carbon13 took less than 10,000 years, that being the time from the non-depleted samples to maximum depletion of carbon13. The onset in continental cores took an estimated 8 to 23,000 years. Whilst such timescales are geologically rapid, in human timescales this would be more of a chronic release of methane. Schmidt & Shindell investigate the PETM using an atmospheric chemistry model and climate model. They find that 0.3Gt (Gt=1000,000,000 tons) per year most closely matches the forcing that tallies with the geological record, and that a larger emission scenario of 3Gt per year over 500 years produces a higher forcing than is justified by geological observations. This does not mean that the PETM was not catastrophic, nor does it mean humanity is unlikely to invoke this feedback by emissions of CO2. Furthermore as I've argued in the previous post there is good reason to expect transient pulses of methane as part of the process of their dissolution. However overall the PETM was a catastrophe that unfolded at a slower pace than some public commentary on this issue might lead one to expect. Figure 1c of Hansen & Sato 2011. Estimated deep ocean temperature changes for the last 500k years. This figure is presented to illustrate the Holsteinian and Eemian interglacials, which were warmer than the Holocene, the interglacial from which the current epoch, the Anthropocene, has risen. It is noted in the text of Hansen & Sato that the temperature changes of the deep oceans were only around two thirds as large as global temperature changes. To that must then be added polar amplification, the physics for which would apply in the past as now, so there is good reason to suppose that the Arctic was warmer still. Jakobsson et al examine beach records from the Holocene. They found that between 8,000 and 6,000 years before present Arctic sea-ice was substantially lower than at present. They show that July 65degN insolation was around 10% higher than at present. Funder et al examine beach ridges as indicative of sea-ice on the northern coast of Greenland, they find beach ridges that are indicative of the presence of open ocean where there are ice shelves at present. They also note that temperatures in the north of Greenland were around 2 to 4degC warmer than at present. Dyck et al find that the early holocene is dominated by a positive Arctic Oscillation (AO) mode, with enhanced first year sea-ice growth in the seas off Siberia due to an enhanced transport of sea-ice from the east to the west Arctic (enhanced transpolar drift). The Holocene Thermal Maxiumum (HTM) was a period of warming following the last ice age after the start of the holocene, the warmth was driven by higher summer insolation than at present. Kaufman et al found that the West Arctic (mainly Arctic North America) was only 2degC warmer than the 20th century average, which would make it only marginally warmer than present Arctic temperatures. However the pattern is complex with different areas of the region studied having different times of HTM, and different levels of warming. Renssen et al carried out a modelling study and found that Arctic temperatures were up to an average around of around 2degC, with the Laurentide ice-sheet reducing that by just under 0.5degC. However the Laurentide ice sheet was over North America and as Hansen & Lebedef have shown the climatic scale of global warming is robust to up to around 1200km, so it seems reasonable to suggest that the Laurentide ice sheet had little effect on Siberian temperatures. With regards the HTM in the Russian Arctic sector, I can't find much at all. Wikipedia states "The Holocene Climate Optimum warm event consisted of increases of up to 4 °C near the North Pole (in one study, winter warming of 3 to 9 °C and summer of 2 to 6 °C in northern central Siberia)". But the source of that claim is a Russian published paper that didn't come up in my searches and has a very brief abstract. So it is possible I've missed important Russian literature. Even though temperatures show an equivocal picture, with temperatures being at least around current Arctic levels but perhaps some degrees warmer, sea-ice proxy studies show a significantly reduced Arctic sea-ice pack. It has already been observed that since 2007 end of summer sea surface temperatures in areas of open ocean are several degrees higher than previously in areas of open ocean, and the the ocean so exposed to sunlight is warmed (ice albedo effect), that warming being mixed down into the ocean column. The physics behind this are general, so would have applied during the HTM. Whereas the recent warming may only have come close to matching HTM temperatures in the last decade, the sea-ice state was lower, and crucially during the HTM the warmth (however warm it was) and reduced sea-ice lasted many centuries, enough time for warming of the Arctic Ocean and to penetrate sediments. Yet we don't see catastrophic releases of methane at during the HTM. This point also applies to the Holsteinian and Eemian interglacials. As they're much older periods data is sparse, however Hansen cites temperatures of the deep ocean as having been warmer than the present. It is often asserted in public discussion that Arctic sea-ice has a tipping point that will drive a rapid transition to a seasonally sea-ice free state. Such assertions have been made in association with claims of an imminent destabilisation of methane hydrates on the ESAS. However these arguments seem to fall before the evidence, because evidence from the past shows less sea-ice and higher temperatures with substantially greater summer solar forcing produced neither a rapid transition to a stable seasonally sea-ice free state, nor a massive (enough to substantially raise atmospheric methane) venting of methane from the ESAS. One possible explanation for this apparent problem with regards methane and the ESAS is the history of methane hydrates on the ESAS. Recently Andy Revkin has interviewed Dr Shakhova and Dr Semiletov, in that interview he posts comments from them about modelling research into the effects of post glacial inundation of the ESAS, together with a response from the leader of the team who conducted the modelling study; Dr Dmitrenko. Firstly, elsewhere I've seen the Dmitrenko paper queried on the basis of citation numbers, that is not a sound method, science is about understanding, it is not a popularity contest. Dmitrenko et al model permafrost subject to the recent changes in the Arctic and find that the recent warming (last 30 years) has only lowered the hydrate stability zone by 1m, they conclude that the emissions of methane from the ESAS is due to a long process of warming initiated by the inundation of the ESAS by sea level rises following the last glacial. It is claimed by Semiletov & Shakhova that Dmitrenko et al assumed a thaw point of zero degrees (C), whereas observations show hydrate melting at below zero. This is important because the warming in that area is warming up from substantially below zero. Dmitrenko responds to this criticism stating unequivocally that the assessment of the model is wrong and that the model does simulate unfrozen sediments at below zero degrees, rounding off by saying that their paper had not been carefully read. This is a strong response that can be checked with reference to the paper (indeed it includes a quote from the paper). So I do not think Shakhova and Semiletov are correct in their criticism of Dmitrenko et al. Dmitrenko et al raises a crucial issue. Shakhova, Semiletov and their colleagues working on the ESAS are involved in crucial cutting edge work on methane emissions from that region, and the possibility of increased emissions in future. However because their work is cutting edge, the observations are new and lack longer term context. What Dmitrenko et al's study suggests is that the current hydrate melt and consequent methane emissions are the result of a longer term process, so these emissions may have been going on for millenia, unobserved. I am reminded of the example of Bryden et al and observations of the Meridional Overturning Circulation (MOC) in the North Atlantic. Bryden's initial results appeared to show a large reduction in the MOC, leading some excitable commentators to declare that the MOC (otherwise known as the Thermohaline Circulation) was shutting down. At the time RealClimate expressed doubt about the slowing of the MOC, and were subsequently proven to be correct, see here for related posts at RC. Likewise it is possible that the observations of methane emissions from the ESAS are sampling something that has been going on for some time, possibly millenia. With spatially limited observations over a short timescale it is no surprise that the observations don't yet answer the question of whether that is the case. However these observations are crucial because they at least present the start of a series of data that will reveal whether what is being seen is intensifying as the process of Arctic warming, driven by AGW, proceeds. Our measurements of CH4 taken in 1994–9 and 2003–10 over the ESAS demonstrate that the system is in a destabilisation period (Semiletov 1999a, Shakhova et al 2010a, 2010b, 2010c). Shakova et al 2010a is a paper that uses seven scenarios of methane emissions, different amounts over short and long timescales, and calculates the impacts of these on global average temperature and radiative forcing. Shakova et al 2010b & c contain more relevant detail to the question of whether the ESAS is destabilised, they can be taken to support the hypothesis that the ESAS is destabilised. Shakhova & Semiletov 2006 find that in 2003 the area weighted methane flux was 4.86 X 10^10 g/cmsq/hour and in 2004 it was 3.02 X 10^10 g/cmsq/hour, supporting the large interannual variability noted elsewhere. So whilst the research clearly shows that methane hydrates are destabilising this does not determine whether this is an exceptional condition unique to recent decades and due to AGW. Dmitrenko et al's findings that the destabilisation is a long term situation with its origins in the inundation and massive warming at the start of the holocene are not rejected by the above stated references. All this said, the work of Shakhova, Semiletov, and colleagues is vital, and I've been impressed by what I've read of their work. Together with observations from ground stations and satellite, their work provides the first basis of a marine methane hydrate early warning system. When the currently destabilised methane deposits on the ESAS start to join their land counterparts in a substantially increasing trend of emission, the groundwork these scientists are laying will be crucial. Significant funding for their efforts can be viewed as a prudent insurance policy for the planet, especially as humanity seems hell-bent on Plan A (Business as Usual). Dmitrenko et al, 2011, "Recent changes in shelf hydrography in the Siberian Arctic: Potential for subsea permafrost instability." Dyck et al, 2010, "Arctic sea-ice cover from the early Holocene: the role of atmospheric circulation patterns." Funder et al, 2011, "A 10,000-Year Record of Arctic Ocean Sea-Ice Variability—View from the Beach." Hansen & Sato, 2011, "Paleoclimate Implications for Human-Made Climate Change." Jakobsson et al, 2010, "New insights on Arctic Quaternary climate variability from palaeo-records and numerical modelling." Kaufman et al, 2004, "Holocene thermal maximum in the western Arctic (0–180 W)"
Francis et al, 2006, "Interglacial and Holocene temperature reconstructions based on midge remains in sediments of two lakes from Baffin Island, Nunavut, Arctic Canada." McInerney & Wing, 2011, "The Paleocene-Eocene Thermal Maximum: A Perturbation of Carbon Cycle, Climate, and Biosphere with Implications for the Future." Renssen et al, 2004, "Simulating the Holocene climate evolution at northern high latitudes using a coupled atmosphere-sea ice-ocean-vegetation model." Shakhova et al 2010a "Predicted methane emission on the East Siberian shelf." Shakhova et al 2010b "Geochemical and geophysical evidence of methane release from the inner East Siberian Shelf." Shakhova et al 2010c "Extensive methane venting to the atmosphere from sediments of the East Siberian Arctic shelf"
"polar amplification, the physics for which would apply in the past as now"
Physics sure, but perhaps not the pattern. IOW will Milankovitch-driven polar warming look the same as GHG-induced warming? Note that in the former insolation increases seasonally at high lats (in winter if I recall the mechanism correctly) whereas with GHGs heat is added in the tropics and is advected poleward. I don't know the real answer, but it looks to me as if things ought to be different. A related point is that heat from the Gulf Stream and Agulhas seems to be the major factor in warming the Arctic Ocean and far North Atlantic, rather than atmospheric warming. Re the ESAS clathrates (and related methane-bearing and methanogenic deposits), my concern is based on the fact that they're mostly Pleistocene-era, and that they couldn't have existed under the ~+2C GAT equilibrium conditions of the mid-Pliocene. That says nothing about speed of release, but it is cause for considerable concern. Past behavior in this instance is no comfort at all since the rate of temp increase is far quicker than is possible due to natural processes. Similarly, the PETM would seem to be a poor analogy since on an ice-free planet all of the clathrates would have been quite deep and prone to release only as fast as the deep ocean could warm, which I would expect not to have been very quickly. I've read the Dmitriov study and, while I lack the expertise to critique it, it makes me nervous that similar models (similar in the sense of showing a long, steady melt without abrupt processes) of land permafrost were recently tossed in the recycling bin when it was observed that abrupt melt processes had become extensive and were on the increase. Those km-wide bubble chimneys may nor may not be increasing at the moment, but they sure do sound like they could become abrupt. Finally, the prominent American collaborators who the NSF recruited to work with the Russian team, Joye and Leifer (leading experts in the fate of dissolved methane in water and in its detection, respectively), haven't been heard from at all. It'll be interesting to see the forthcoming papers involving them. But the big mystery here seems to be that in the SS interview Shakhova didn't say anything about trend monitoring, which can't have been unintentional. She said something to the effect that the observed region is very large, making monitoring difficult, and that the regions they observed this year (with the chimneys) weren't previously observed. Yet they've been out there for some years now, and I'm sure that the technique of conducting surveys of large areas via sampling with transects is known even in Siberia and Alaska, maybe even especially. Very strange. That's a point that constantly amazes me - if one only listened to the denialsphere, you'd have the impression climate scientists are constantly stretching the truth to make the situation seem more adverse than could possibly be justified. The reality seems to be they almost always err on the side of conservative caution. One only need look at the 'consensus' opinion on melting of the arctic sea-ice. It's been a steady underestimation going on two or three decades now. That poor track record is one of the I simply can't discount Maslowski's projections. With regards patterns of warming, the evidence shows differences, as noted in the main post the most detailed review paper covering the West Arctic shows different HTM maxima at different times and a complex pattern of warming. However most of the recent warming is not directly due to CO2 but due to Arctic Amplification, which includes changes in influx of warmer air from lower lattitudes, but has as a major factor warming due to reduced sea-ice. 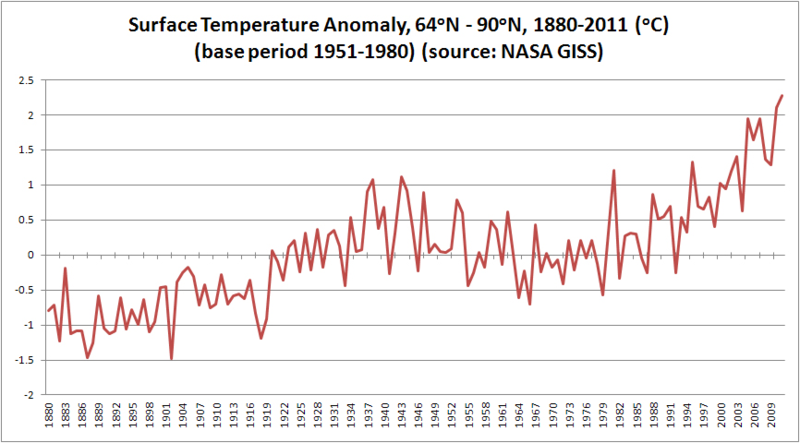 Furthermore Overland in "The Recent Arctic Warm Period" notes that the recent warming is widespread in nature, as compared to the strongly regional warming of the 1940s. This recent warming is largely driven by Arctic amplification, such amplification would probably have been the response to the HTM warming, so on balance I still think it's hard to see how the ESAS could have been spared atmospheric warming during the HTM. That's before we get to the issue of ice-albedo and direct warming of the ocean due to reduced sea-ice. You've pre-empted a point I'll be making in my third and final post. Yes I do think it's possible that as we warm the Arctic outside of the range of warming of the Pleistocene we may find out that we can trigger a PETM type response (rising to a ballpark of 0.3Gt/year methane emission) at lower initial warming than may have happened in the PETM. However I still think talk of an imminent (i.e. this century) and catastrophic CH4 release is being made on a weak basis of evidence. And there's still the issue of lack of a catastrophic response during the Holsteinian, Eemian & HTM. Each model must be judged on it's own merits. To do otherwise is falling into the same territory as the denialist fringe. I too am not in a position to evaluate Dmitrenko's modelling study, however the criticism that's been levied against it doesn't seem to hold water - Dmitrenko gave a strong response, one that would be foolish if the model didn't have liquids at below freezing. How abrupt could the chimneys become? As I discussed in my first post there's reason to suppose the amount of CH4 in their vicinity is less than in stable sediments, and the evidence shows that the eruption of pockmarks is a self-limiting process. I agree that we'll see 'burps', I'm just not convinced by some of the catastrophist hyperbole that's blown up around this subject. I agree regards trend monitoring, from the papers I've read I can only presume that the emissions recorded have high interannual variability so don't show a trend. By 2100 I think it's virtually certain such a trend will be clear, regardless of how much fossil fuels there are to burn. How about we list the times when there's been overstatement? Surely the point is that when the evidence is there the conservative position advances? Chris, I think you entirely missed my point about the circulation differences. To focus on the key issue, would we have expected the ocean current changes presently observed with past Milankovitch- driven warming? I doubt it. But conversely, we should expect atmospheric warming from the latter to be sharper. I may be wrong, but the oceanic changes seem far more important than the atmospheric ones. In any case the difference seems worth noting. Re abrupt processes for undersea permafrost melt, I imagine we shall see very soon, perhaps even with some of the Semilitov group's papers this year. (And out of curiosity, is anybody else up there even looking for this stuff?) My point in analogizing to the fate of the former land permafrost models isn't that any sort of trend in abrupt processes undersea has been shown, but that a long-standing assumption that they weren't present on land collapsed utterly just in the last few years. It doesn't make me sanguine about the undersea stuff. But ultimately, absent some real trend obs we're just speculating. Re Dmmitrenko, I'm not criticizing them at all, no more than I'm crticizing land permafrost modelers prior to incorporation of new observations of abrupt melt processes. After all, modelers can only model with available physics and data. I do get your point about the ocean circulation. However I still think localised ocean warming due to reduced sea-ice cover in the HTM would be a robust transposition from current observations. And in the main post I reference Dyck et al (model study) finding enhanced ice growth off Siberia due to the transpola drift, that suggests open water in the summer over the ESAS. Yes there are a number of researchers investigating the ESAS, most Russian, however most of the papers about it seem be centred around Shakhova and Semiletov. In the process of researching these posts I've read around 20 papers, many more abstracts. When I come to post I tend to try to keep to a core of pertinent papers. I think that the issue of abrupt releases of methane from undersea sources is fairly well understood. Seismic surveys reveal their fingerprints and there's a lot of research into mechanisms, and the physics of sub-sea hydrates that has a bearing on this issue. I think we need to be clear regarding terminology: I do not disagree that the process of decomposition of hydrate will be abrupt - but I sea this as taking place on a localised scale - with many localised such events. But I don't think the evidence suggests we face a massive 'blow out'. It's like the difference between exploding a large volume of petrol vapour and air vs the many small explosions in an internal combustion engine. I see what we face as more like the latter case. "open water in the summer over the ESAS"
But even if so, how much and for how long did it warm the underlying water? That point is what makes me wonder about the applicability of the HTM, Eemian and Holsteinian to present circumstances. But now I should go off and see what the AR5 WG1 FOD has to say about all of this. AR5 WG1 FOD = IPCC Fifth Assessment, Working Group 1 (Physical Science Basis - the interesting bit of AR5) First Order Draft. Which has just finished expert review. The leaked AR5 documents are available here. However chapters 6 and 7 aren't available. The chapter list here states that chapter 6 is the one relating to the carbon cycle and feedbacks. I've done a cursory word search in Acrobat reader and can't find anything relevant in the documents available. Saying that such abrupt process are well understood now seem to me to be overly bold, Chris, noting that Dmitrenko et al. didn't include them in their model, presumably because they couldn't. In particular, establishing an upper limit on them seems like little more than guesswork at this point. Pointers to papers claiming otherwise would be appreciated. The FOD cryosphere chapter is available, although I have yet to look. Over in the current RC thread, someone just posted the 400 mb AIRS methane data for January of this year and last. It does seem striking, although one hesitates to construct a trend from two data points. :) But have you had a look at that? I did say "fairly well understood". Dmitrenko were looking at the penetration of warming into sediment layers. I've already stated (previous post) why I don't agree with the claimed amount of methane viable for release from discontinuities in the sediments. I think it's much lower than Shakhova and Semiletov are stating. So my main focus is on the bulk of the methane - in the sediments of the ESAS away from discontinuities. Yes I've seen the AIRS image for January, it is signifcantly more intense than any previous January, or indeed any other month in the series. Context helps, which is why I recently did the videos of AIRS, and there is a large amount of interannual variability, as is also shown by the timeseries from AIRS. That said, there is a notable increase in the winter post 2007. As I've posted recently there does seem to be a pattern associated with the ESAS, however the largest pattern is from land emissions, not the ESAS. This latest image from AIRS cannot simplistically be taken as linked to the ESAS (which is what I've been posting on). For a given area the atmospheric concentration of methane is due to; previous balance, influx from other areas, chemical destruction, influx from the surface within the area. During winter chemical destruction is limited by the cold, the pattern is widespread so over that whole area we can neglect influx from other areas leaving surface flux. The problem there is that over much of that area temperatures have been down below -30degC for the past January (NCEP/NCAR). There has been a Dipole structure to sea level pressure (Siberia high vs West Arctic low), but the temperature anomaly pattern shows a small warming apart from in the Atantic sector. So the region concerned is seriously frozen up. Crucially, during the months when the region thaws the atmospheric concentration drops as the temperature accelerates the CH4 + OH reaction. So I'm not getting worried about increasing methane emissions during the winter. Because of the OH + CH4 reaction temperature dependence it takes less CH4 to increase atmospheric concentration during the winter than during summer. I think we will see such increases (provided Siberia warms wet) as the regional warming continues, it constitutes a problem (making the task of tackling AGW harder), but I'm not losing sleep over these latest results. I had been going to post tonight about these implications but decided to watch a film instead. "the sediments of the ESAS away from discontinuities." Re the AIRS data, that is at ~7 km altitude, so I suppose we would want to know about the pattern of mixing to be sure about the origin. Which kind of brings us right back to Dmitrenko et al. That being the most recent paper dealing with how fast the warming has penetrated into the sediments. To be clear S&S's statement regarding 50Gt of methane poised for imminent and catastrophic release does concentrate on the methane around discontinuities. I've questioned this, and I may be wrong, only challenges to my reasoning on that issue will show if I am wrong. If I'm not then the amount that may be poised for imminent release is substantially less than 50Gt, thus taking the sting out of the catastrophic 'tail'. Yes AIRS is at 400mb (not sure if this is as high as 7km - tropo is thinner at the poles, particularly in winter), however as I've argued recently there does seem to be a persistent pattern in the region of high methane activity in the ESAS. This suggests that localised surface sources may be detectable. My argument is in essence that if a pattern is apparent from year to year (though not necessarily every year), then atmospheric mixing means the pattern is probably due to either a 'real' surface source or 'aliasing' caused by incorrect assumed surface emissivity.